SCIENTIFIC: A member of the Quartz family, Tibetan Black Spot Quartz forms as either single or double terminations found in clear quartz, water clear, cloudy, frosty, gray and smoky quartz compositions with "black spot" inclusions due to the presence of carbon, hematite, and other black colored minerals. Tibetan Black Spot Quartz’ hardness is rated at 7 on the Mohs scale of mineral hardness. Tibetan Black Spot Quartz is found in the Himalaya Mountains located in Nepal and Tibet. ATTRIBUTES: Tibetan Black Spot Quartz has an enhanced crystal vibration that resonates with the energies associated with thousands of years of spiritual practice. Tibetan Black Spot Quartz is energetically programmed with ancient and eastern esoteric knowledge. Tibetan Black Spot Quartz crystals may enhance and amplify rituals, healing work, shamanic work, meditation, channeling sessions and activate the healing properties of other crystals. Double Terminated Tibetan Black Spot Quartz Crystals are powerful stones for spiritual protection and purification as the energies of these crystals creates a bubble of light around the body. Tibetan Black Spot Quartz has a powerful "OM" vibration and makes an excellent crystal tool to use to intensify transformations with regards to healing and spirituality. HEALING: Tibetan Black Spot Quartz stimulates the immune system and is a master healer on all levels. Tibetan Black Spot Quartz may be used for healing and repair of the nervous system, including the myelin sheath, the brain, and the nerve ganglia that generate the electromagnetic energies of the chakras. Tibetan Black Spot Quartz may be a beneficial crystal tool for the stimulating the meridians offering centering and increased energy levels. Tibetan Black Spot Quartz would make a wonderful crystal tool for past life regression or to help understand the past-life reasons for present life dis-ease or karmic lessons. In crystal body layouts or healing grids, Tibetan Black Spot Quartz harmonizes all the chakras aligning the subtle bodies and bringing the body into balance. Tibetan Black Spot Quartz energetically facilitates deep healing on a cellular level. Tibetan Black Spot Quartz activates the Third Eye, enhances higher dimensional communication, and accesses the Akashic Records. 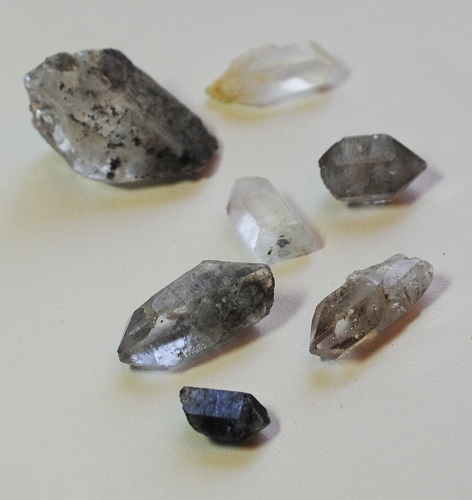 For Gaia Healing, Tibetan Black Spot Quartz may be placed in an area of Earth energy to enhance the subtle energies of the entire environment. The energy of Tibetan Black Spot Quartz combines well with high energy Moldavite, Lemurian Seed Crystals, Phenacite, Azeztulite, Faden Quartz, and the calming energies of Lithium Quartz Crystals.